From the Retro Humor collection by Vandor. 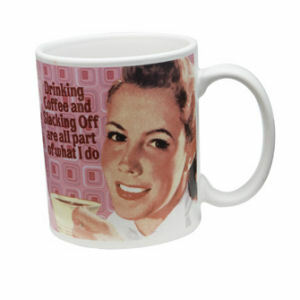 Retro Humor by Ephemera Raising Kids and Coffee Collection Drinking and Slacking 12 oz Decal Mug. This Item is in stock and ready to ship. You should not postpone your purchase and miss out on adding Retro Humor by Ephemera Raising Kids and Coffee Collection Drinking and Slacking 12 oz Decal Mug to your Retro Humor collection! From the Retro Humor collection by Vandor. Retro Humor Raising Kids and Coffee Collection Drinking and Slacking 12 oz Decal Mug. Says Drinking coffee and slacking off are all part of what I do.